TALLAHASSEE, Florida, January 7, 2011 (ENS) – As a result of cold weather, twice as many manatees died in 2010 as the average number of deaths over the past five years, according to biologists with the Florida Fish and Wildlife Research Institute. Two periods of unusually cold weather in Florida contributed to the 767 manatee carcasses documented in state waters last year, the biologists said in a report Wednesday. “The unusually high number of manatee deaths in 2010, including those caused by the two periods of cold weather, are of concern to the Fish and Wildlife Conservation Commission,” said Gil McRae, director of the research institute. The cold weather caused many of the 767 deaths, with the “cold-stress” category accounting for 279 documented cases. Of these cold-related deaths, 244 occurred in the early part of the year and 35 occurred in December. Cold stress also contributed to the deaths of 21 of the 96 manatees in the “perinatal” or “newborn” categories, the biologists said. In addition, they consider it likely that the cold temperatures contributed to many of the 214 deaths in the “undetermined” category and the 68 deaths in the “unrecovered” category. Dr. Katie Tripp, director of science and conservation with the nonprofit Save the Manatee Club says the 767 manatee deaths represent more than 13 percent of the species’ estimated minimum population. 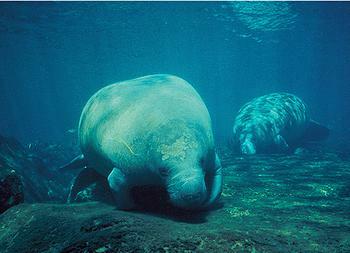 Protections for Florida manatees were first enacted in 1893. Today, they are protected by the Florida Manatee Sanctuary Act and are federally protected by both the Marine Mammal Protection Act and the Endangered Species Act.